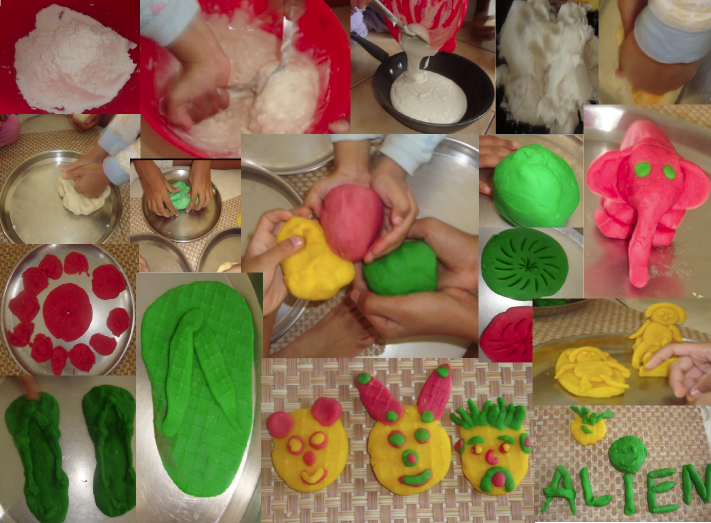 As part of the Sunday reading/crafts session I do, we tried “cooking” play dough. Must say this was such a super hit, the kids are asking for repeat session already. Goal was to make the kids measure, mix, feel the texture, observe the texture change from coarse to smooth. And of course the glow on the kids faces when they start mixing color to the cooked playdough and see it all coming through after patiently waiting for 15 minutes! – For smooth texture, dissolve salt in water. Pour this salt water on the flour. For coarse texture, mix salt directly to the flour and add water. – Add cooking oil and cream of tartar. – Mix them all up nicely, so there are no lumps. Consistency should be a little thicker than pan cake dough. – Cook in low heat till the dough thickens. (When the dough thickens, it will separate from the pan ). ( Food coloring can be added to the dough before cooking also, we added after cooking so we can try different colors in the same batch of dough). – Knead the dough. The more you knead, the smoother the dough becomes. Also, it takes a little while for the color to mix with the dough and brighten up. – Store in air tight containers for reuse. Ohhh why don’t you send these in for artsy-craftsy?? The crafts look so cool. wonderfull, where are you doing these art works ?? in school or home or some centre , where ?